Founded by Charles Ira Hood in 1875, C.I. Hood & Co. of Lowell, Massachusetts was among the largest patent medicine companies in the United States and offered a number of personal health products in addition to its well known Hood’s Sarsaparilla. The C.I. Hood and Company was a leader in the development of color lithography as an advertising tool, and produced all of its advertising in-house and owned twenty presses issuing a plethora of colorful trade cards, posters, calendars, cookbooks, pamphlets, and other ephemera all promoting the medicinal benefits of company products. According to Richard Howe, “In 1876, Charles followed the lead of J.C. Ayer & Company and began to compound his own sarsaparilla medicine. In addition to sarsaparilla root, he mixed in dandelion, gentian, juniper berries and 18% alcohol. He claimed great success in curing a variety of disorders including “purifying the blood”, heart diseases, dropsy, rheumatism and scrofula. Within two years of launching his product he was on his way to great success. Charles Hood added to his success with Hood’s Tooth Powder, Vegetable Pills, Oil Ointment, Medicated Soap, Dyspeplets (for dyspepsia), TusSamo (for cough) and Hood’s Lotion. Following his death in 1922, the C.I. Hood & Co. business was sold by his widow. From: Drug and Chemical Markets, Volume 11 (Google eBook) Drug & Chemical Markets, 1922. The front of this card depicts a cherub with wings blowing on a long horn and holding a box of Sarsaparilla. The bottom caption reads “Hood’s Sarsaparilla, Purifies the blood, Creates a appetite, makes the weak strong and builds up the system. Prepared only by C.I. Hood and Co. Apothecaries, Lowell, Massachusetts. The reverse of the card states “Purify Your Blood. The importance of a proper purification of the blood should induce all to use means to secure the health and happiness resulting from pure blood and a normal condition of the entire human organism. When this vital fluid is contaminated, diseases of various kinds present themselves, such as a feeling of general debility, weakness, loss of appetite, dyspepsia, nervousness, constipation, headache, and the more positive signs of blood impurities, Scrofula, Salt-Rheum, Cancerous Humor, Scald Head, Boils, Scrofulous Humor, Syphilitic Affections, Cancerous Bones and Etc. At this very time the sufferer is looking for some way of relief, and just here we wish to ask attention to Hood’s Sarsaparilla and the wonderful record it has made in purifying the blood of hundreds of sufferers and bringing back to them the boon of health. Hood’s Sarsaparilla is a carefully prepared extract of the best remedies of the vegetable kingdom known to medical science as Alternatives, Blood Purifiers, Diuretics and Tonics, such as Sarsaparilla, Yellow Dock, Stillingia, Dandelion, Juniper Berries, Mandrake, Wild Cherry Bark and other selected roots, barks and herbs.” The price is one hundred doses, $1.00 and six bottles $5.00. 1885 High-Street Cookbook, published by the ladies of the High-Street Church. Lowell, Massachusetts. C.I. Hood Co. republished this as an advertisement booklet for its bestselling blood-purifying medicine, Hood’s Sarsaparilla. Mentioned at the end of each recipe, this cure was a mixture of sarsaparilla roots and dandelion, along with 18% alcohol. Read by a wide-cross section of consumers, mass media almanacs played a major part in disseminating health care information to the general public. Good Bread Practical Reliable Directions of Great Value to Housekeepers, Written By The Best American Authority Especially for Hood’s Sarsaparilla, C.I. Hood & Co. Published by C.I. Hood & Co., Lowell, Mass., 1888. Hood’s Sarsaparilla advertisement booklet by Bunner, H.C. “The elephant’s love or Zenobia’s infidelity. Presented with the compliments of C.I. Hood & Co. proprietors of Hood’s Sarsaparilla. Lowell, MA” No publisher, 1891. Each page of this “comic” tale of a misguidedly affectionate elephant is ruled, with a testimonial to the medical benefits of Hood’s Sarsaparilla appearing below that; a reprint from Puck (edited by Bunner) and Short Sixes, it is illustrated with a number of small cuts, its pale green paper wrapper bearing two larger ones. Hood’s Sarsaparilla Trade Card from the World’s Columbian Exposition in Chicago, 1893. I have a hoods sarsaparilla clear glass apothecaries bottle . Is this an antique ? 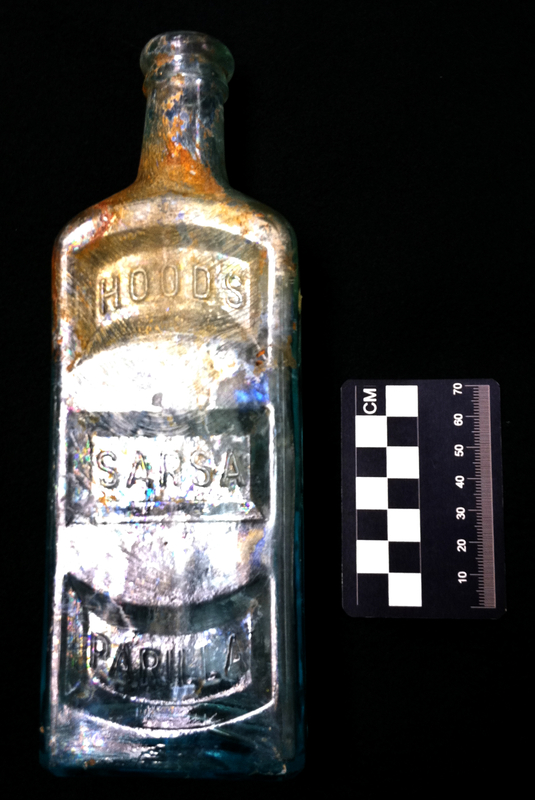 I found a hoods sarsa parilla bottle,but it has New york & St. Louis on the side,not mass. Is it worth anything ? The bottle was used after 1922. CI Hood died in 1922 and everything was sold and the company shut down in Lowell. I don’t collect Hood items after the company left Lowell, MA but I would guess that if the bottle is clean and in mint condition it could be worth $8-$10. I enjoyed your article. What I found a bit upsetting is you have at least two of my images of calendars 1890 and 1891) with no mention of where you got them from. It takes time to fine a purchase pristine full calendar examples, prepare the image for on line presentation etc. All I ask is you give me a by-line where you got them. Not looking for gain or fame just a thank you in the way of a “Courtesy of”. This happens to me a lot and I address every one I find. I’m not mad just wanting recognition for what I’ve done. It’s on your site and all you had to do is cut and paste! Thank you Jessica. you’re welcome to anything as long as there is a notatation of some sort as to where it was obtained. Thanks again. I have a painting almost identical to a Sarsparilla Victorian trade card depicting hounds with a young girl dressed in fox hunting clothes. The advertising writing on the crate is not in the painting and the girls face is more serene than on the cards. Do you know anything about the original art work used? I’m guessing the painting is a copy of the trade card but I can’t find any information relating to the original artist. I can’t find a name on the painting. Hi. Sorry, but I don’t have any information about that. Good luck in your searching. Okay, thank you for your prompt reply. The trade card has C. BUTON BARBER’s print of “THE YOUNG HUNTER”. Hello Cliff. Thank you so much for the information. Very much appreciated. Yes, eBay but unfortunately they have bottomed out. 1897 is about the cheapest. I believe it’s a coupon calendar with a little girl. They range mint in mailing envelope from 100 bucks down to $9.99 or less. If I can see a picture front and back. I might be able to help. Otherwise take a looke on eBay just type in Hoods Calendar and the date. I have 22 of the Hood’s Photos of the World collection. Are there Hood or ephemera collectors out there who would be interested? A few are in great condition, a few have dogeared corners and one has a missing/torn corner. All the Photos and writing are good and clear with the No. and caption clear. I would welcome any interested parties. I have linked to this post from page 86 of the Earl J. Arnold Advertising Card Collection [ http://bit.ly/ArnoldCollectionsPage86 ] with the additional advice given to read the comments, where I have found additional great information. Thanks again, Jessica! info on Hoods Political Points booklet circa 1888. can You give some info on this advitertizement booklet. I’ve got the Hood’s Pansy Booklet, Intact. Bindery in Good Condition. Front Cover not brilliant, Back cover looks great. Interior pages in good, not too fragile, condition. hole from tack all the way through in upper right area as if tacked to a wall. thoughts? Just putting a random web address so I can satisfy the requirement. I was wondering if you know how rare the black and white Hood’s 1922 calendar is? I also have a Hood’s advertising piece that shows 4 cats sitting on a foot stole it is not a trade card on the stole it says 100 doses 1 dollar any info would be thankful. Hi, thanks for reading! The articles here are meant to provide a historical context for the products and packaging of the past. I don’t have any information about your item and I’m not an appraiser. For your own knowledge you might look at sold listings on eBay to ascertain what others have paid for the item. Hope this helps! The B&W 1922 calendar is one of the rarer Hood’s Calendars. The 1922 falls into a similar rarity category as the 1886, 1911, 1916, 1917, 1920, and 1921. All of the calendars are displayed on my website http://www.cliffhoyt.com then follow the links to Hood. Your Cats image is most likely the back cover of the pamphlet “Hood’s Latest Vol. 5 No. 5” dated 1884.